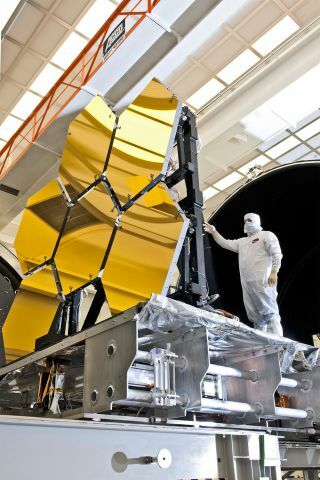 In September 2011 engineers completed coating of James Webb's 21 mirror segments with microscopic layers of gold. WASHINGTON — The U.S. Senate Appropriations Committee approved a spending bill Sept. 15 that would cut NASA’s budget by 2.5 percent while boosting spending on the massively overbudget James Webb Space Telescope (JWST) and tying the release of hard-fought commercial crew money to the start of work on a congressionally mandated heavy-lift rocket. Overall NASA’s budget would drop to $17.9 billion — a $510 million reduction — if the Senate version of the 2012 Commerce Justice Science Appropriations bill becomes law. Sen. Barbara Mikulski, the Maryland Democrat who chairs the Senate Appropriations commerce, justice, science committee, said she and her Republican counterpart, Sen. Kay Bailey Hutchison (Texas), faced tough choices in drafting the NASA spending bill. "We’ve gone beyond frugality. We are now into austerity," Mikulski said in presenting her bill to the full committee. "This means NASA will once again be asked to do more with less." NASA’s other science programs were largely spared in the Senate’s hunt for more money for JWST, which stands to get $530 million next year, or about 40 percent more than NASA budgeted. But the agency’s nascent Space Technology program was not so lucky, losing nearly $400 million from its $1 billion request. NASA’s human space exploration budget would remain essentially flat for 2012, with $1.8 billion carved out for the heavy-lift Space Launch System (SLS) rocket and $1.2 billion designated for its companion Orion Multi-Purpose Crew Vehicle. The bill would cap total spending on SLS and Orion at $17 billion through 2017, the year NASA plans to conduct the launch system’s first unmanned test flight. sets aside $548 million to cover NASA’s contractual obligation to make up a shortfall in space shuttle operator United Space Alliance’s pension program. permits the transfer of up to $10 million to the U.S. Department of Energy to re-establish domestic production of a plutonium isotope used in spacecraft power systems. adds $16 million to NASA’s Explorer Program "to ensure that current and future announcements of opportunity can support two stand-alone missions, one in astrophysics and one in heliophysics." directs the agency to spend $75 million "to continue efforts to use the next generation of human space flight architecture to service existing and future on-orbit observatory-class scientific spacecraft, as well as spacecraft owned by the Department of Defense and other Government agencies." Neither the House nor Senate have schedule a floor vote on their respective NASA spending bills. With the 2011 fiscal year ending Sept. 30, time is running out to complete work on 2012 spending bills. The House Appropriations Committee on Sept. 14 introduced a stopgap spending measure, called a continuing resolution, that would keep federal agencies operating at roughly their current levels through Nov. 18.